An ex-director of Brazil's state-run oil company Petrobras is reported to have accused more than 40 politicians of involvement in a kickback scheme. Paulo Roberto Costa - who is in jail and being investigated for involvement in the alleged scheme - named a minister, governors and congressmen. But the names, published in a magazine, also included rivals of Ms Rousseff. Many of the names were published in Veja, one of Brazil's leading magazines, just weeks before the presidential election in which Ms Rousseff is running for a second term in office. Several politicians mentioned have denied involvement. Mr Costa claimed that politicians received 3% commissions on the values of contracts signed with Petrobras when he was working there from 2004 to 2012. Mr Costa was arrested in 2013. He is now in jail and struck a plea-bargain deal with prosecutors before giving the names. Ahead of the election, Ms Rousseff's approval ratings have been slipping in opinion polls in favour of her rival, former Environment Minister Marina Silva. The BBC's Wyre Davies in Rio de Janeiro says the latest allegations could hurt the incumbent further, as during her presidency Petrobras has dramatically underperformed and its costs have risen sharply. It has become one of the world's most indebted oil companies and lost half of its market value in three years. 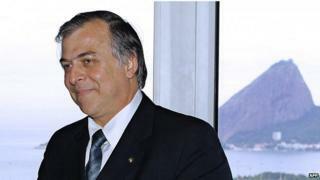 The BBC has requested a comment from Petrobras about the latest allegations and is awaiting a response.